The Tenderlonious-led, London-based outfit Ruby Rushton has gradually evolved in size and sound, since its first incarnation released the Two for Joy LP in 2015. At the time, they were a quartet with Yussef Dayes in the drum stool. With their new record Ironside, they’ve returned to the four-man combination and welcomed Tim Carnegie on drums, but in-between those bookending projects, the band laid down two gorgeous volumes of Trudi’s Songbook as a six-piece, with bass and auxiliary percussion reinforcing the sound and the occasional feature player bringing further brass into the equation. While their line-up has flowed freely, their principals remain unchanged. From the outset, they’ve prided themselves on being well-drilled, musically communicative and articulate – sufficiently so that it became their forte to track entire albums in single sessions. They’ve also adhered to Tenderlonious’ pragmatic “everything that you need is always right in front of you” attitude, their band name and select track titles, approach to recording and emotional subject matter coming from the world he inhabits and therefore remaining heartfelt and true. A constant since the beginning of the band has been the presence of trumpeter Nick Walters, who as well as playing with Tenderlonious and co., works with Riot Jazz and The Paradox Ensemble amongst others. A big Miles Davis fan, we were keen to ask his thoughts on two pivotal Miles LPs, sixty years on from their release as well asking about the sessions for Ruby Rushton’s new LP Ironside. Ironside drops on 5th April and Ruby Rushton return to Manchester on 23rd April, supported by Mayling. You play in several ensembles, including Ruby Rushton, Riot Jazz, Manchester Jazz Collective and with The Paradox Ensemble. Can you tell us about the demands and creative rewards of playing in these different combinations, and how it improves you as a musician? Nick Walters & The Paradox Ensemble from Very Tall on Vimeo. With Ruby Rushton, you’ve previously tracked albums in intensive, single day sessions. Was that also the case with Ironside, or was the workflow slightly different this time around? NW: ‘We had two days in the studio this time, but there was no let up in the workload or the intensity of the sessions! So there were a couple of long hard days, but definitely an enjoyable and exciting process to go through’. How, if at all, has your role in Ruby Rushton developed as the ensemble has evolved in size and sound? 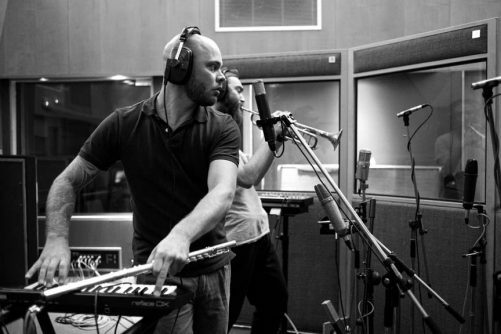 How was the experience of working at Abbey Road on the new record? How did the reality compare with your expectations, and were you at all daunted by knowledge of the film music and classic records that had been made there down the years? As a music listener, what are your preferences when it comes to following and consuming music? Do you go for any particular formats and does listening to music play a particular role in your life, outside of your own creative process? Miles Davis’ Kind of Blue and Porgy and Bess LPs have been subject to plenty of attention recently, with the commemoration of sixty years since their initial release. As a trumpeter and leader of a large ensemble, what are your thoughts on those two records and how they’ve stood the test of time? NW: ‘Two of my favourite albums! I have loved both of these records for many years – Miles was probably the main influence on my musical development as a young trumpeter and the collaborations with Gil Evans have been a huge inspiration to me composing and getting together my own band the Paradox Ensemble’.